Based on the novel by Stefan Zweig, Fear is the story of an affair between a renowned scientist’s wife and another man where the latter’s former love threatens to expose them. Directed by Roberto Rossellini and screenplay by Rossellini, Sergio Amidei, and Franz von Treuberg, the film is an exploration of infidelity set in post-war Germany as it is shot on location in Munich. Starring Ingrid Bergman, Mathias Wieman, Renate Mannhardt, and Kurt Krueger. Fear is a compelling yet flawed film by Roberto Rossellini. Set in post-war Germany, the film revolves the wife of a scientist who decides to end her affair with her lover in order to fix her marriage as she is then blackmailed by her lover’s former lover who threatens to tell the woman’s husband about the affair. It’s a film that plays into a woman coping with guilt as well as trying to move on from it yet there’s forces that want to destroy her. 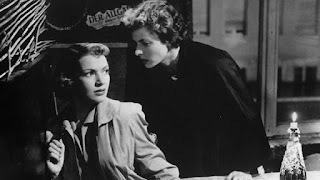 Much of it is told from her perspective in a film noir first-person narrative as Irene (Ingrid Bergman) copes with the guilt and shame of her infidelity as she has to deal with this woman named Johann Schultze (Renate Mannhardt) who has a grudge with Irene over the fact that she stole her lover Enrico (Kurt Krueger) from her. The film’s script plays into Irene trying to move on but the presence of Johann would add to her troubles as there’s more layers to the blackmail as it emerges but the outcome ends up being very predictable. Roberto Rossellini’s direction is very intriguing for the way it plays into the world of infidelity in Germany where the country is starting to come out of the post-war era. Much of the compositions that Rossellini creates don’t just borrow from the world of film noir but also German Expressionism in terms of its images and moods. It plays into Irene’s own sense of paranoia and anguish with these intricate lighting schemes in the cinematography to add to that eerie mood. Rossellini’s usage of close-ups and medium shots also add to that sense of style that looms all over the film including shots set on location in West Berlin and other parts of Germany. As much as Rossellini maintains that air of suspense for much of the film, things do start to fall apart in its third act as it relates to a minor plot twist and then comes its ending where it is a cop-out since there was so much invested into Irene’s own anguish and paranoia as there was only one logical conclusion. Instead, the ending strays into conventionalism as its ends up being unsatisfying. Despite its ending, Rossellini does still creates a very engaging suspense drama about a woman coping with her infidelity. Cinematographers Carlo Carlini and Heinz Schnackertz do excellent work with the film‘s stylish black-and-white photography from the scenes set at night to the usage of lights and shadows for some of the film‘s interiors as it plays into the eerie mood of the film. Editors Iolanda Benveneuti and Walter Boos do terrific work with the editing in terms of its rhythmic cuts as well as knowing when not to cut in certain long takes as it adds to the air suspense in the film. The sound work of Carl Becker is superb for the way it plays into the suspense for some scenes set at the factory lab where Irene and her husband work at as well as a few scenes set in the city. The film’s music by Renzo Rossellini is fantastic for its usage of orchestral flourishes and bombast to play into the suspense as it features themes that help create a mood for a scene as Rossellini’s score is a major highlight of the film. The film’s amazing cast includes some notable small roles from Gabriele Seitz and Elisabeth Wischert as Irene and Albert’s children and Klaus Kinski as a cabaret performer at a club Irene and Johann meets. Kurt Krueger is terrific as Enrico as Irene’s lover who has no clue about what Johann is doing while Mathias Wieman is excellent as Irene’s husband Albert as a renowned scientist who is freed from prison as he tries to comprehend Irene’s strange behavior. Renate Mannhardt is brilliant as Johann Schultze as Enrico’s former lover who stalks Irene as a woman who is tormented by what Irene has done to her but also has this dark edge that makes her very engaging to watch. Finally, there’s Ingrid Bergman in a sensational performance as Irene as this woman who decides to end her affair in order to fix her marriage as she deals with a jealous woman and cope with the guilt and shame that she caused as it is one of Bergman’s finest performances. Fear is a stellar film from Roberto Rossellini that features a solid performance from Ingrid Bergman. Despite its conventional third act and ending, the film is still a fascinating noir film that plays into a woman coping with the guilt of infidelity and her attempts to move on. In the end, Fear is a superb film from Roberto Rossellini.